I think it was two days ago when I put my old cheap stud earrings (that I got from Forever 21) back onto my second and third holes in my left ear. My third hole is closing so I took my time pushing it and it was not fun at all. It was yesterday when I felt pain on my ear and it's swelling around my earrings. 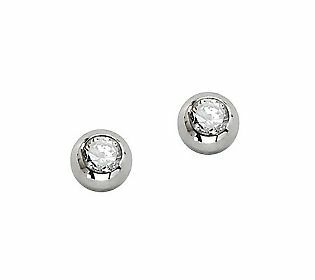 So I get online and I went straight to QVC and luckily, they have stud earrings this time that is called Steel by Design. I have looked and looked since the day I am hooked on their site, and I am just happy. The Steel by Design is actually one of my favorite product that they have. It started when my mother in-law gave me a bracelet from them on my birthday like three years ago. From that time then, I started loving their durable stainless steel designs. 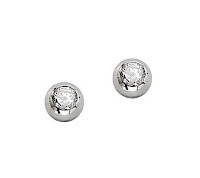 Yesterday, I purchased a stud earrings and I'm actually patiently waiting for it to arrive already. Darn it, the swelling on my ear is honestly bugging the hell out of me. Usually when I wear super cheap jewelries, my skin always react and I started itching. Somehow, the Steel by Design jewelries have not bug me. I never thought I could enjoy wearing jewelries that is neat and inexpensive. Don't get me wrong, I love cheap stuff but sometimes, you get what you paid for.